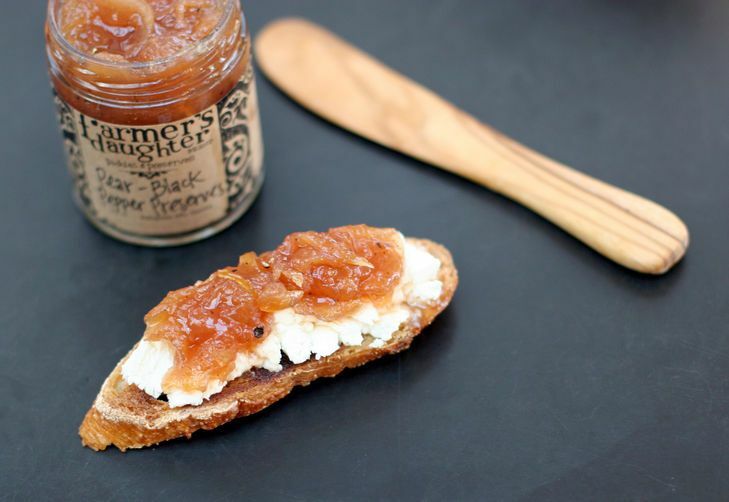 Today: April McGreger from Farmer's Daughter Pickles & Preserves shares a recipe for spiced pear preserves that are cooked low and slow -- a perfect canning project for winter's darkest months. April McGreger is the owner of Farmer's Daughter Pickles & Preserves, a small batch preserving company focusing on the best of the local harvest in the North Carolina Piedmont. In addition to winning four Good Food Awards for her delicious jams and pickles, April teaches preserving classes and writes about food. She is an author of The Southern Foodways Alliance Community Cookbook, and has a book coming out this fall titled Sweet Potatoes: A Savor the South Cookbook. These black pepper-spiked preserves are a twist on traditional southern-style pear preserves, which are traditionally spooned over hot biscuits. They are cooked slow and low so that the syrup thickens, but the pears retain their shape. This, along with their thick, spreadable consistency, differentiates them from most jams, which are cooked hard and fast. Black pepper lends a pungent complexity to this variation that makes a natural complement to a cheese or charcuterie board. They are particularly magical spooned over warm crostini topped with a blend of ricotta and grated Pecorino Romano cheeses, and drizzled with walnut oil, like this one.